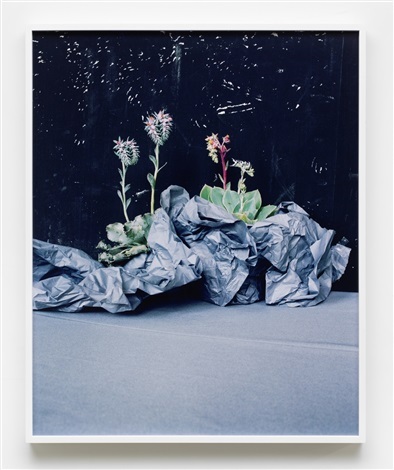 Annette Kelm’s constructed photographs of ordinary things offer us a chance to reengage with materiality and form. Under the high-key glare of studio lights, like commercial pack shots after the products have been packed away, Kelm’s compositions are contained autonomous worlds, lyrical correspondences of texture, pattern, density, weight, light and colour. In Desert Plants an outcrop of succulents peep over scrunched plastic. Pizza Pizza Pizza shows brittle bark, as if protruding from the picture surface, doubled by a pitch-dark shadow cast by flash light. Everything has its place in the laissez-faire still life, Welcome. Describing photographs almost always involves recourse to things represented. Writing in 1934, the French art historian Henri Focillon observed how, as soon as things enter the space and materials specific to art, viewers confuse the notion of form with that of image and sign, reading into form a meaning other than its own. Therefore, he writes, we must recognise that a new value is produced and ‘that these new values and new systems should retain their alien quality is a fact to which we submit with a very poor grace’. Focillon almost certainly didn’t have photography in mind, a debased medium slavishly bound to actuality. Kelm’s constructed photographs, at their most effective, achieve this alien quality of form signifying only itself. It’s a quality, however, that’s unstable, almost miraculous, because form in the photograph, bound to actuality, is more likely than painting to be confused with that of the image and sign. While Kelm’s photographs grant form its alien life, they’re also irretrievably of things, things with specific material histories, or personal significance for Kelm and the viewer. Kelm applies the same formal sensibility to photographing things of such extra-ordinary historical significance – which often bear relation to photographic technology and other reproductive industries – that they’re put on display. Zuse 1, shot in Berlin’s Deutsches Technikmuseum, shows a closely-cropped detail of a replica of the binary mechanical computer ‘Zuse 1’, designed in 1938 by Konrad Zuse. Controlled by a programme punched into celluloid film, it shares characteristics with contemporary computers, including memory, and input and output devices. 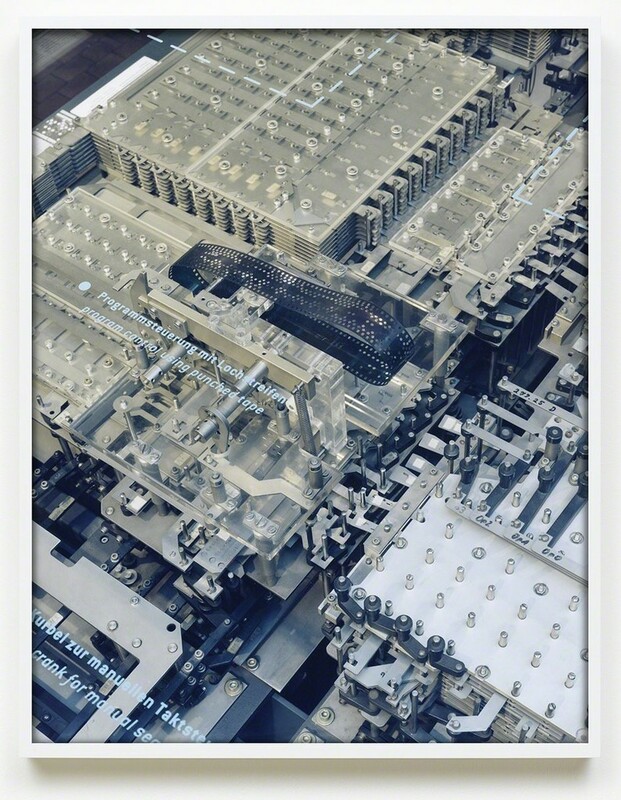 Kelm trains her large-format camera, itself an anachronism, on this replica of obsolete technology – the machine looking at a machine – as if to inquire their degrees of separation. (Elsewhere in the DTM, Kelm has photographed a Jacquard loom, a weaving machine programmed by punched cards, and the basis of Charles Babbage’s mechanical computer, the Analytical Engine.) Zuse 1, with its celluloid, mechanical parts and memory, is an antecedent of the computing that has transformed the contemporary production and global circulation of not only photographs, but commodities. Today photography, like money, is a medium of exchange by which commodities circulate (photographs, critic Kaja Silverman remarks, are ‘the shop windows in which most commodities gleam’). 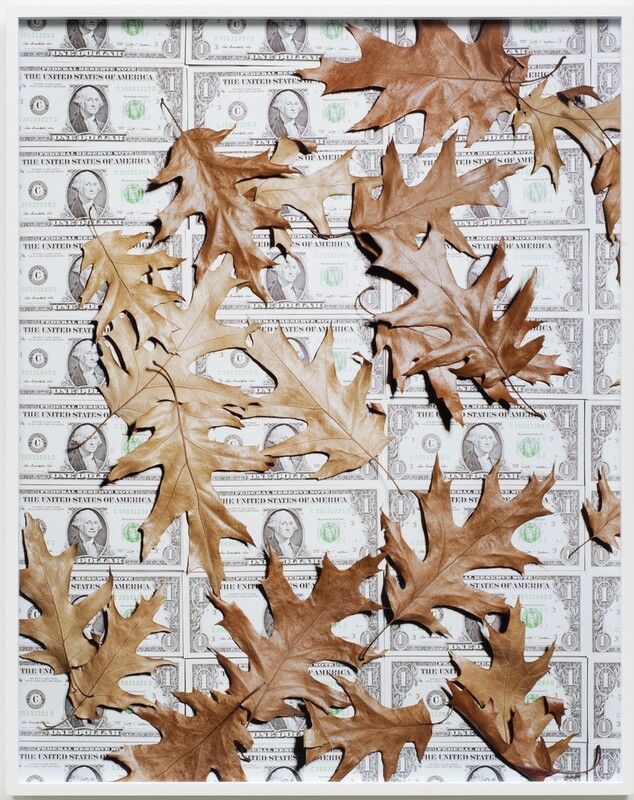 In Leaves, a flat, gridded ground of dollar bills (‘CU’: Crisp, Uncirculated) throws a windfall of brown leaves into relief. High-key forensic light reveals the surprising uniformity of their structure; accentuated by hard shadows, the variegated surfaces gleam along crisp contours and folds. Nature, a gleaming commodity, performs in the storefront window of the photograph. (A similar motif is transposed into photographs in Kelm’s book Home Home Money Grid, published by Hassla earlier this year, in which money may as well be growing on trees.) Kelm connects the abstraction of money with photography’s relation to abstraction. Poised ambiguities of form in her constructed photographs, which appear to be one thing and yet may be other things, for example the Mercedes Benz emblems in Stuttgart 4 / Stars With Ladder, destabilise their apparently robust objective style. Through her own engagements with photographic materiality and form, Kelm, to return to Focillon, locates the fissures by which we continue to dream in an age of increasingly abstracted entanglements of images and capital.